For one-semester courses in anatomy & physiology. Celebrated for its precise illustrations, time-saving navigation and study tools, and engaging clinical content, Essentials of Anatomy & Physiology is crafted especially for readers with no prior knowledge of anatomy & physiology and little science background. The Seventh Edition eases readers through tough A&P topics, answering the need to help A&P readers learn and retain challenging content. New book features, all supported by interactive MasteringA&P media, include new Build Your Knowledge activities, new Spotlight Figures Coaching activities, new Bone and Organ Dissection Videos, and new Dynamic Study Modules that help readers study on the go. MasteringA&P is an online homework, tutorial, and assessment program designed to work with this text to engage students and improve results. Instructors ensure students arrive ready to learn by assigning educationally effective content before class, and encourage critical thinking and retention with in-class resources such as Learning Catalytics™. Students can further master concepts after class through traditional and adaptive homework assignments that provide hints and answer-specific feedback. With a wide range of activities available, students can actively learn, understand, and retain even the most difficult concepts. FREDERIC (RIC) MARTINI, PH.D. (author) received his Ph.D. from Cornell University. In addition to his technical and journal publications, he has been the lead author of ten undergraduate texts on anatomy and physiology or anatomy. Dr. Martini is currently affiliated with the University of Hawaii at Manoa and has a long-standing bond with the Shoals Marine Laboratory, a joint venture between Cornell University and the University of New Hampshire. He has been active in the Human Anatomy and Physiology Society (HAPS) for 24 years and is now a President Emeritus of HAPS. He is also a member of the American Physiological Society, the American Association of Anatomists, the Society for Integrative and Comparative Biology, the Australia/New Zealand Association of Clinical Anatomists, the Hawaii Academy of Science, the American Association for the Advancement of Science, and the International Society of Vertebrate Morphologists. EDWIN F. BARTHOLOMEW, M.S. (author) received his undergraduate degree from Bowling Green State University in Ohio and his M.S. from the University of Hawaii. His interests range widely, from human anatomy and physiology to the marine environment, “backyard” aquaculture, and art. Mr. Bartholomew has taught human anatomy and physiology at both the secondary and undergraduate levels. In addition, he has taught a range of other science courses (from botany to zoology) at Maui Community College (now the University of Hawaii Maui College). For many years, he taught at historic Lahainaluna High School, the oldest high school west of the Rockies, where he assisted in establishing an LHS Health Occupations Students of America (HOSA) chapter. He has written journal articles, a weekly newspaper column, and many magazine articles. Working with Dr. Martini, he coauthored Structure & Function of the Human Body and The Human Body in Health and Disease (Pearson). 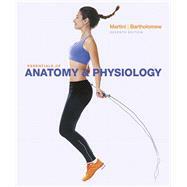 Along with Dr. Martini and Dr. Judi Nath, he coauthored Fundamentals of Anatomy & Physiology, Tenth Edition. He also coauthored Visual Anatomy & Physiology, Second Edition, with Dr. Martini, Dr. William Ober, Dr. Judi Nath, and Dr. Kevin Petti. Mr. Bartholomew is a member of the Human Anatomy and Physiology Society, National Science Teacher’s Association, and the American Association for the Advancement of Science.